Why Have a Garage Sale? Here is why…. 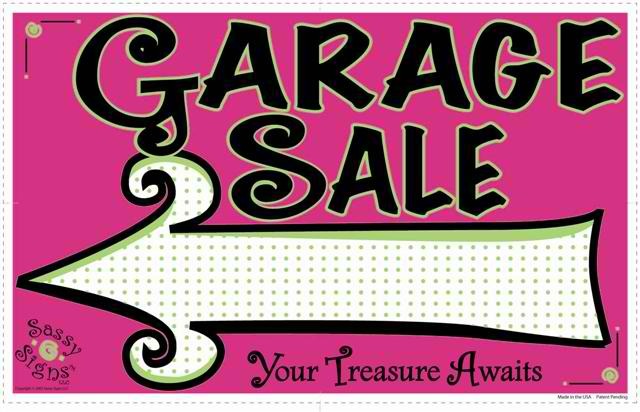 Along with everything you need to know about having a garage sale from start to finish! Have fun! I generally take about 2 months to leisurely put together everything I want to sell in my next yard sale. During this time, I’m also doing a bit of spring cleaning while purging all items we no longer wear or use. I group items together by “theme” in a spare bedroom (and/or the garage), and in the weeks leading up to my yard sale, I actually start pricing the items and printing out all my signs. Planning and preparation is the key to a successful yard sale — in my opinion. Start by going room by room through your house looking for items that you no longer want or use. As you collect items that you want to sell, place them in large garbage bags or boxes and store them in a seldom-used room in your house, or inside the garage. 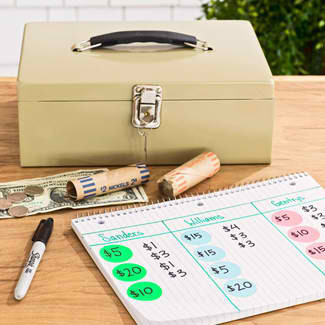 If you are able to group items by “category” or “theme”, it will be much easier to price the items and set them out for display at your yard sale. Think back to what went wrong and what went right at your previous yard sales. 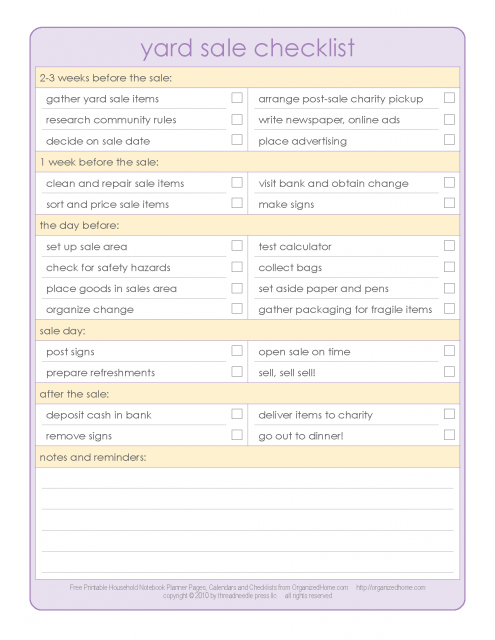 Make mental notes of things you want to do at this year’s yard sale, based on what you’ve learned from previous ones. And if you want to do it even better the next time, then take the time to jot down some notes, and make a point to save any items that you can reuse at future yard sales. For example, I’ve probably hosted a dozen or so yard sales in my lifetime, and I have one large Rubbermaid container that contains all my “necessities”. So, whenever it’s time to have another yard sale, I just drag out that one bin and everything I need is right there. 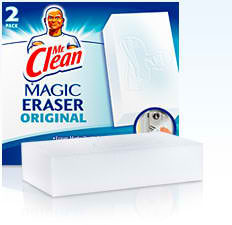 This year, I found a lifesaver… it’s called the Mr. Clean Magic Eraser! Those little white cubes worked “magic” for cleaning things up a bit. For the yardsale, they worked best on hardbound books, removing soot from candle jars & candle holders, and cleaning out all the tiny nooks & crannies on plastic things like coolers, chairs, handles, lids, etc. Also helpful were Lysol Cleaning Wipes. I used those to wipe-down practically everything I was selling. As a result, many of the items I was selling looked much newer than they actually were! Although you may have the friendliest dog in the world, it’s best to keep them away from your yard sale. Some people are afraid of dogs or are allergic. The day of your yard sale may be the day that your friendly dog, unaccustomed to the excitement of all the people, may decide to take a chunk out of the toddler that pulls on his tail. It’s also for the dog’s safety as well, since cars will be coming and going from your driveway. After early spring garage sales, summertime yard sales are always a hit. End-of-the-summer garage sales do just about as well as early spring sales. Oh, and yard sales held at the beginning of the month may be a bit better than those held at the end of the month. Saturdays are without a doubt, the best. Sundays are rarely as profitable as Saturdays. However, Sundays usually attract the diehard yardsalers — the ones who are on a mission and typically looking for very specific items (…the ones who “do this every Sunday”). But, unless you promote some very specific & hard-to-find items in your yard sale ad, chances are a Sunday yard sale will hardly be worth the time you spend sitting there waiting for people to arrive. Tip: Sundays are a tad more successful at the very start of the yard sale season (March/April… depends on where you live), because people who like to go to yard sales are so eager to start visiting yard sales again! Many people start their yard sale at 8AM, only to find a swarm of cars waiting eagerly for you to “open” around 7:15 AM! Unless you prepare for this ahead of time, you will always be a step behind. And, as a result, you’ll probably have a bunch of hastily prepared displays and a disorganized yard sale space overall. Most likely, you will end up spending half your morning working around people, while trying organize your space. Talk about frustrating! Do You Need Yard Sale Signs? 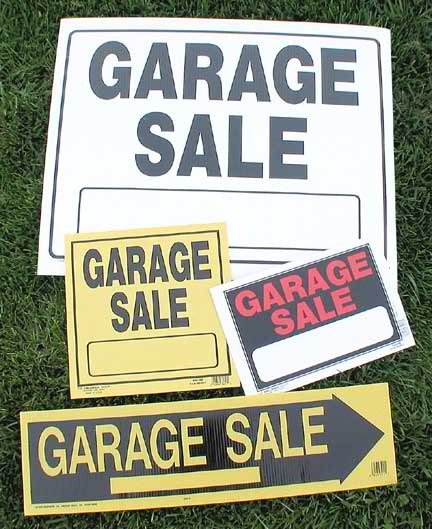 Neighborhood and directional signs will show people how to find your yard sale — whether they first saw your ad or not. Be sure to make a mental note of all the places you’ve posted signs so you can take them all down after the sale. Leaving garage sale signs up after the sale is tacky and junks up the neighborhood. Plus, the signs tend to shrivel up and fall to the ground anyway. And you don’t want to litter! Some placed have restrictions regarding the placement of signs, so be sure to check with local officials in your area. Remember, you want your sign to be readable from a long distance away, so use very thick lettering. Also, the larger your sign is, the better. Posterboard size is best. On most roadways, people are traveling too fast to be able to read whatever is printed on a standard 8-1/2″ x 11″ piece of paper. You could also take a cardboard box and tape colorful posterboard-sized paper to each side with the details of your sale. This sort of 3-D sign attracts a lot of attention! Otherwise, you’ll just end the day frustrated and sad that you went to all this trouble to set up and run a day-long (or 2-day long) yard sale… yet you’ve got nothing to show for it! My advice is to just sell everything and be done with it, rather than try to make some outlandish profit in the end. It’s far more frustrating to be left with most of what you started with in the end than it is to sell it for too low of a price. I’ve found that most shoppers would rather know what you’re asking for an item (thus, price tags or yard sale stickers are a necessity). And only about one-third of those will try to talk you down on the price. If you don’t have price tags (or table signs) on all of your items, then chances are the very shy people (or someone who is just mildly interested in an item) won’t ever speak up and ask you the price. People who might have bought, if they only saw a pricetag on the item, will just quietly leave your sale instead. I generally price every single item, one-by-one. Tip: I always keep my pricing materials (blue painter’s tape & Sharpies) in close reach throughout the sale, in case I forgot to price something. Or, I decide at the last minute to sell 2 items separately rather than as one item. Or, I choose to lower the price at the last minute. Plus, I’m always adding items to the yard sale up until the very last minute when I close down. Sites like these can be used as a guide for what to price things. Your best bet is to find the highest and lowest prices for a particular item, then pick a middle-ranged price — if you really want to sell it, that is. If a particular item is something that’s near and dear to your heart, then pick the higher price — just know that you’re likely to end up keeping it. As a rule, I price everything 50 cents higher than I’m actually willing to sell it for. That way, I’ve got some “bargaining room”. I’ve found that most people try to talk you down 50 to 75 cents, on average. Keep in mind, yardsalers are thrifty shoppers looking for bargains. They want rock-bottom prices that are far below what they could buy the item for in a store… brand new. You don’t want to intimidate people with high prices. You want to get rid of your stuff! * Children’s Toys – range greatly in price, usually from .$25 to several dollars depending on the brand and quality of toy. * Electronic Equipment and Furniture – can go for a lot of money, but only if in good working order and cleaned and maintained properly. Half-way through your sale (if not sooner), you need to take a step back and assess the situation. If items are selling, then you probably don’t need to do anything differently. This makes your sale fun and unique too. I’d recommend you print up some signs for this purpose ahead of time — just in case. Or, if it’s late in the day, and you see someone looking at a particular item for a few minutes longer than most, yet they don’t buy it. Before they leave, offer that item to them at 1/2-price. Most of the people I’ve done this with will actually buy it at the lower price! The early bird gets the worm but the late bird gets the closeouts! #1 Move anything you don’t intend to sell. First and foremost, anything you do not want to sell should be moved as far away from the yard sale area as possible. Or, cover those items with blankets and tarps. I can’t tell you how many times people have wanted to buy items that were simply being stored in our garage. #2 Find unique “props” for displaying your items. Take a walk through your home and your garage — even glance through your attic and basement storage spaces — looking for items that have flat surfaces or unique hanging areas that would provide unique display spaces for your yard sale items. Ladders work wonders as a clothing display rack (if you’re selling any clothing items). Use the ladder steps themselves as tiered racks to put your hangers. What I did: I set an old shower curtain rod across the top portion of the ladder (braced between the planks of a standard A-frame wooden ladder). While the pole would remain fairly secure on its own, I used blue painter’s tape to secure it in place. Plus, by evenly distributing clothes on both sides of the pole — on either side of the ladder itself — your set-up will be even more balanced and secure. Card tables, TV trays, even upside down cardboard boxes (sturdy ones) and crates work wonders as a means for displaying your items for sale at a garage sale. Use your porch and nearby steps to place items at various levels. This makes it easier for people to see these when they’re just glancing around. You can even place items down the center of the driveway itself (on blankets, towels or tarps, if desired), leaving either side of the driveway as walkways around the items. We used the large cloth & plastic tarps that served as drop clothes when we painted the rooms in our house. Tip: You want to get things up off the ground as much as possible. Card tables & upside down boxes are generally better than blankets, and ground-level displays. #3 Morning dew & afternoon sun can wreak havoc. Since the grass is usually wet from dew in the morning, I recommend using double layers of blankets etc. on the grass, rather than a single layer. You’d be surprised how quickly the water seeps through a blanket — even when the grass doesn’t appear to be that wet! Wet spots not only make your displays look tacky to your early morning visitors, but they could also damage certain items that should never come in contact with moisture (books, papers, magazines, cardboard, and some electronics). On the flip-side… in the afternoon the sun’s heat could make some of your items on display become very hot to the touch. And if people can’t pick up an item to examine it, then they’re not going to buy it. Just the same, some items (candles, blow-up plastic items like air beds & pool floats) could even melt! Yep, it happened to me. So, in the afternoon, be sure to examine any items that have been setting out in the sun. You may need to move some of them into shadier areas, underneath tables, or maybe into the garage to permanently cool down. #4 Group items by “theme” to increase sales. I’ve found one thing that seems to work really well is to include items of the same “theme” on each table or blanket space. By displaying similar items together, if someone’s looking at a cell phone on your “high-tech gadgets” table, then chances are they might also be attracted to the other computer stuff you’ve got on that table, as well. You could get a double-sale out of this one… all because an old cell phone first caught their attention. #5 Have a “yard sale,” not a “garage sale”. Whether you call it a garage sale or a yard sale doesn’t really matter. What is important is that you treat it like a yard sale and put as much stuff outside of your garage as possible. This will not only help to attract attention, but people are usually hesitant to enter the “personal space” of someone they don’t know — even when invited. Unless you’re a seasoned yard sale shopper, it can be intimidating to march right into someone’s enclosed garage — especially if there’s no one else doing it. This is primarily why “garage sales” are sometimes less successful than “yard sales”. It’s a numbers game… the more people who a) see your sale, then b) choose to slow down when driving by your sale, and c) actually get out of the car to have a look around your sale… the higher your profits will be. Tip:Try to spread all of your items out so that people don’t feel crowded as they browse. #6 Out of sight, out of mind. Regardless of how you choose to display your items for sale, make sure that everything is easily within reach and easily within view. If a person can’t see it on first glance, chances are, it won’t ever be sold. So if there’s anything that’s hidden from view, move it! If that means creating a whole new space for displaying this and/or other items, then by all means, do it. Yard sale items don’t get a 2nd chance to make a 1st impression. You get one shot — so make it count. Tip: With books & magazines, try fanning them out neatly across the front of a table, rather than stacking them one on top of the other..
Just remember, people aren’t likely to dig through or step over stuff to get to an item that looks interesting. Nor will they look up high or down low. That’s why the majority of your yard sale items should be at one consistent level, or at least be within eyesight as someone scans all of your items from the center point of your driveway. Tip: If you are placing items on the lawn, make sure that you create an “aisle” or a pathway between your items. It’s best if people can walk around and behind each item, because you never know at which angle an item will catch someone’s eye. Besides, items on the lawn are harder to reach, unless you create pathways so people can get closer to items from all sides. The more items (and the larger the items, the better) that you place up closer to the street, the more likely you will entice more people to stop at your sale. When people have to get out of their car to see the type of items you’re selling, about half of them will just skip it and drive on. So instead, make it easy for them by placing all your best stuff up close to the road if possible. Honestly, people are usually so shocked to see something for free, that they simply don’t believe it. And it’s only those who are TRULY interested in the item who will actually ask about it. So, it’s a win-win… you only get the serious inquiries, and you both feel good about giving & receiving something for nothing! What about all of those “free samples” you receive in the mail? (Believe it or not, serious yardsalers will intentionally sign up for free samples just to have freebies to hand out at their yard sales! …A yard sale is definitely a win-win for everyone involved! I actually like to have an entire section of free stuff. Because, when it comes right down to it, you know that everything you have is not going to sell. So why not try to guess which of your items are LEAST likely to sell & just offer those for free right from the beginning. \n\nHonestly, people are usually so shocked to see something for free, that they simply don’t believe it. And it’s only those who are TRULY interested in the item who will actually ask about it. So, it’s a win-win… you only get the serious inquiries, and you both feel good about giving & receiving something for nothing!